The Moving Momentum trading strategy comes from the ChartSchool at StockCharts.com, where you can find comprehensive information on most technical indicators. This strategy goes through a three-step process to find corrections in trends. This is the daily chart of S&P 500 ETF (SPY). 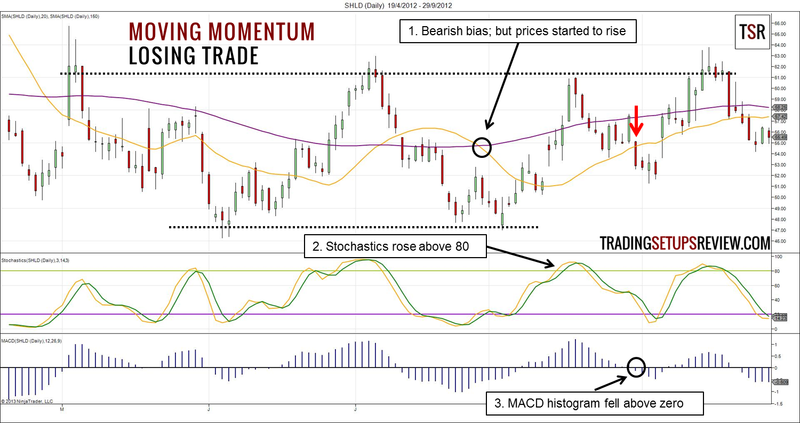 It shows how the Moving Momentum trading strategy found a profitable entry after a deep pullback in the index. The 20-period SMA rose above the 150-period SMA to signify a bullish bias. Slow stochastics fell below 20. It lingered around the lower values as price pulled back substantially. Finally, the MACD histogram went above the zero line and gave us a long signal. This long signal came after price bounced off from a 61.8% retracement of the previous upswing. This daily chart of Sears Holdings shows a short Moving Momentum trade which failed. Paying more attention to price itself might help you to avoid this losing trade. The bearish SMA crossover defined a down trend according to the trading strategy. 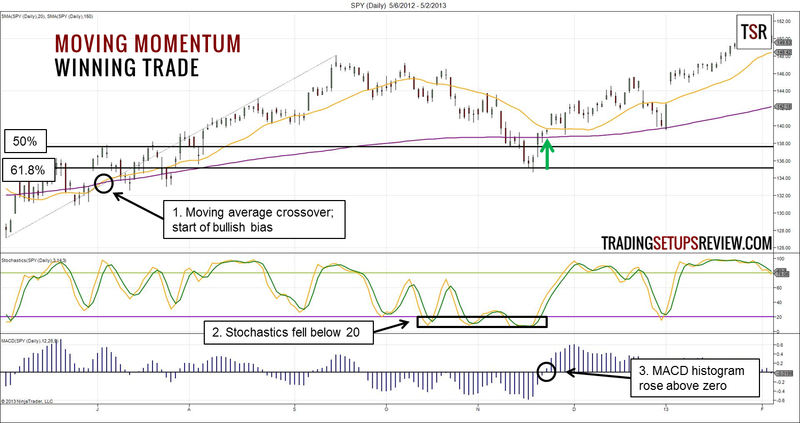 However, price started to rise immediately after the bearish crossover. Furthermore, a trading range (dotted lines) was forming. Stochastics rose above 80 and highlighted the pullback. This pullback is deep and went beyond the 150-period SMA. The winning trade example had a deep pullback as well. However, in the winning case, the trend was firmly established. In this example, the trend was in its early stage when deep pullbacks are unusual. Hence, the bearish bias was in doubt. We went short when the MACD histogram fell below zero. Price shot up and made a higher high shortly after. This trading strategy’s merit lies with its systematic approach to finding trading opportunities. The process and logic of this trading strategy is sound. It uses moving averages to find the long-term trend before using stochastics to find pullbacks. Then, it uses MACD as a trade trigger. MACD is a reliable trade trigger for complex pullbacks. However, for simple and shallow pullbacks, the lagging nature of MACD gives slow signals with bad reward-to-risk ratio. The Moving Momentum trading strategy is not a simple trading strategy. It uses four indicators. The orignal article at ChartSchool correctly pointed out that you will need to calibrate the settings of the indicators according to your trading instrument’s volatility. Adjusting 4 different indicators is not an easy task. 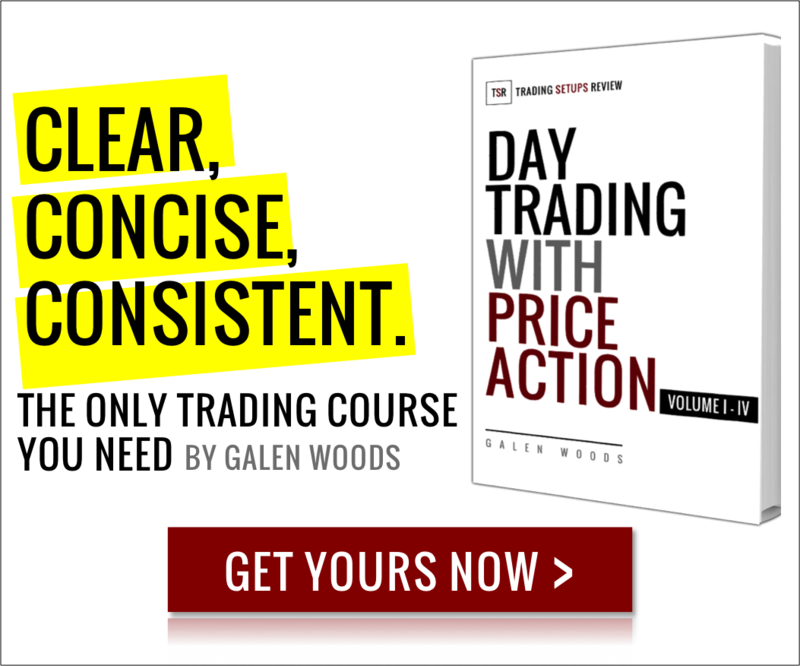 Instead of optimizing the parameters and risk the dangers of curve-fitting, you can use this trading strategy to find trading opportunities before observing the price action to see if the trade is worth taking. Hey Galen.. Thanks for pointing out this method. I’ve been playing with it ever since you mentioned in your previous newsletter. I’ve replaced stochs with %r (easier to monitor with a single signal line than two). Also, putting less focus on EMA20. This method is very solid when it comes to strongly trending markets. Personally, in the last week i’ve managed to enter on corrections to MSFT, ABBV and some other stocks. I’ve been backtesting this method on Ninjatrader (TP of 10%/SL of 2%). And it gives amazing results. Modifying the entries based on 2x the SL (where sl = lowest low of the past x # of bars) helps in reducing the holding period and building cash quickly. Hi John, great to hear from you. Glad to know that you are getting good results with this strategy. And thanks a lot for sharing your back-testing experience including the parameters for TP and SL. That’s very useful for other traders who might want to test drive this strategy.